When it comes to enterprise digital marketing, no one can beat us. At Brainpulse, we focus on expanding your reach and brand awareness by targeting your right customers pan India. Looking to gain customers in in specific city, region or location? Brainpulse is here to help. 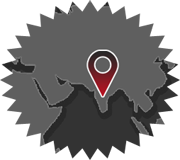 If you think to target your customers restricted to a certain location in India, we will help you make your products/services more relevant to that location specific target audience. Don’t wait any further. It’s high time to reach more buyers, increase conversions and turn insights into ROI. Brainpulse will help you optimize your digital properties to reap the best returns on your digital marketing investment. From SEO to Website Development and from Social Media Marketing to Display advertising, we cater to your business’ unique requirements to deliver best results out of every solution we serve. Whatever the location your customers are at, our versatile, diverse, and ever adaptable approach will help them find you when they need you most. Your potential customers are incessantly searching for the products and services you offer. Our digital marketing ninjas will make sure they find your business on their locations before they find the competition. Be where your customers are looking. Be heard and be found at your locations. We are 20+ years old digital marketing agency known for its high end affordable e-business solutions. From enhancing your brand visibility to migrating your business from offline to online; and from creating state-of-the-art web applications to creating cross-platform mobile apps, we do it all whenever you want.